MacKenzie Theory formed in Melbourne, Australia in 1973, centered around the guitar of Rob MacKenzie and the viola of Cleis Pearce. At the time there was a very active music scene in Australia with many bands experimenting mainly in the blues/rock direction. However there was a growing awareness of the fusion, and in particular Weather Report and The Mahavishnu Orchestra. 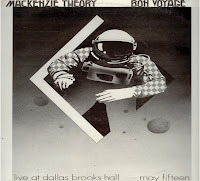 It is from this music that MacKenzie Theory and other bands such as Ayres Rock, drew there influences. They, however, created a style that was unique, no guitar pyrotechnics, but rather etheral chords behind and Pearce's electric viola. The use of a viola instead of a violin was inspired, the deeper tone better suited the music than the high pitch of a violin. MacKenzie was the real leader of the band and the sound centred on his spacy guitar style and very open compositions. Pearce's viola adds a colour that is perfect for the music. They made just 2 albums to a muted commercial response, available only in Australia and long since deleted. 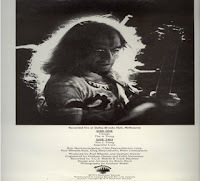 First was "Out Of The Blue" in 1973, was recorded live in the studio, a cheap way of recording an album. Despite this, it worked, as it caught the spontanity of the band and showed off their jazz credentials. Following the first album they toured around the country, trying to summon some interest, but didn't really succeed. When the time came for the second album, it was clear that the band was about to fold, hence the title. Again it was decided to record live, this time in concert. A keyboard was added to the mix with a new rhythm section. The preference for long improvised instrumentals is evidenced by the fact that album comprises of just 4 tracks and I suspect that these are edited. MacKenzie's love of jazz can be seen in the title of the last track,"Supreme Love", an obvious play on John Coltrane's "A Love Supreme". There were a few musicians at that time playing the violin in fusion, most noteably, Jerry Goodman in The Mahavishnu Orchestra, Jean Luc Ponty and Michal Urbaniak. Pearce sounded like none of these. Likewise, no one sounded like MacKenzie on guitar and it is this that creates the unique sound and makes the band so interesting. Futhermore, their excellent musicianship and improvisory skills make this a forgotton classic. The band had cased to exist by the time the album came out and from the cheap cover one assumes that label boss, Michael Gudinski (later to "discover" Kylie Minogue), couldn't see a profit. Both MacKenzie and Pearce disappeared from the scene completely and as far as I am aware, have not played since. Artist info, art, and album submitted by fellow contributor micaus. You can find at least one recent album by Cleis Pearce on Amazon. (sad but) true what Bruce says about MacKenzie. Cleis, however, made 4 albums in the 90's in a band she formed called Coolangubra. She lives/plays in Byron Bay. She isn't widely promoted but there is no way she should be known as not playing since. She is a most amazing and alive musician.